Take a New kind of Lesson in Speed and Accuracy! The Stylus Pick Method is the only speed-picking method in the world which includes a Physical Device that corrects inaccurate Depth Gauging and supports Economy of Motion! Alternate Picking with the Stylus Pick gives you a beautiful, even sequence of attacks as it glides over the strings with no resistance - and provides a vigorous workout in speed and accuracy, so use of a flat pick at higher speeds becomes smooth and effortless. Whether you’re a shredder, jazz player or country picker; beginner, expert, or seasoned performer - the Stylus Pick is a valuable tool for measuring your proficiency and for rapid development of extraordinary high-speed alternate picking technique. 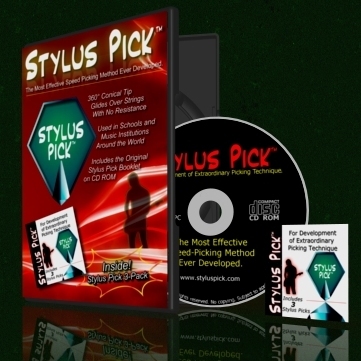 • Stylus Pick 3-Pack (three Stylus Picks) and more!